The Factory Community Centre, the Housing Communities Program, local residents and community workers wants to invite you to participate in the “Cook Garden Mosaic Project”. The final installation of the mosaic will be from the 2nd of May in the corner of Pitt and Raglan St. and everyone is invited to participate. 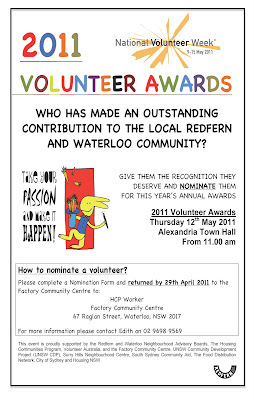 The Factory Community Centre, the Housing Communities Program, local residents and community workers would like to invite you to participate in the Volunteer Community Participation Awards 2011. The awards will be held on Thursday 12th of May 2011 at 11am to 1pm in Alexandria Town Hall and we would love to see you there. 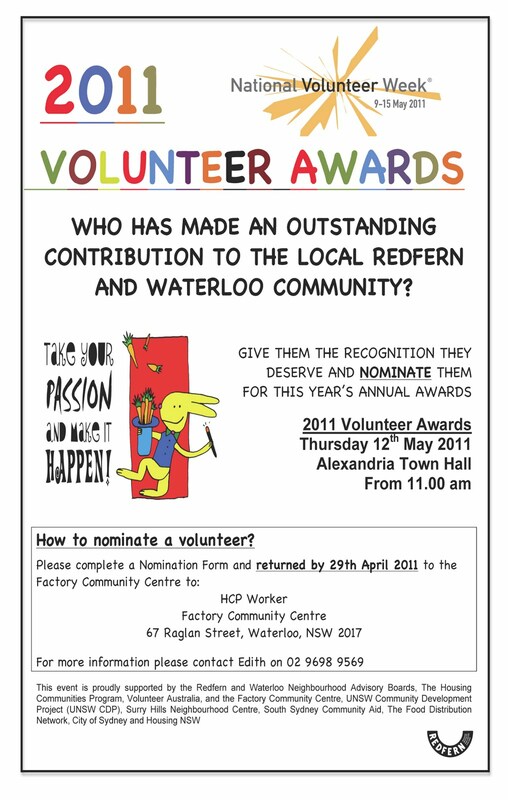 The “Volunteer Community Participation Awards 2011” intends to acknowledge the fantastic skills and contributions of individuals, community groups, and organisations within Redfern, Waterloo and surrounding suburbs. Also this year the awards will be welcoming and rewarding volunteers from Surry Hills. How to nominate a volunteer? Save the children mobile play bus program strives to provide an inclusive environment for children and families to interact in a pleasant outdoor environment. We provide a program were staff help facilitate family/ carer and child interactions. We offer educational equipment, activities, which stimulate children’s development for 0-5 year olds and promote literacy through book readings and songs. We also provide morning and afternoon tea, and a wonderful chance to meet new friends, share experiences and have fun. Quality Management Services invites you to a day of engaging presentations, facilitated discussions and intensive training workshops aimed at helping NSW Health funded non-government organisations share current practice, build skills and discuss challenges related to Quality Improvement. This Community Award will again be sponsored in 2011 by the Eastern Region Local Government Aboriginal and Torres Strait Islander Forum, which incorporates the City of Botany Bay, City of Sydney, Leichhardt, Randwick City, Waverley and Woollahra Councils. The Award aims to recognise those “silent achievers” who have worked so diligently in promoting Reconciliation through selfless acts. They may be your neighbours, work colleagues, family members or acquaintances. They will have one thing in common, and that is their desire to improve the quality of life for people of Aboriginal and Torres Strait Islander descent living within one of above Local Government Areas. The Eastern Region Local Government Aboriginal and Torres Strait Islander Forum is offering the community an opportunity to be a part of the celebration for Reconciliation Week by nominating an individual or organization in the region that has demonstrated their commitment to reconciliation over the past year. Nominees must either live within one of the above mentioned six Local Government Areas and /or working in one of the above mentioned areas and shows a strong commitment to Reconciliation. There are two Award categories: the Pauline McLeod Youth Award is open to individuals 12-24; and the Pauline McLeod Award is open to individuals of any age. As part of our community legal education service, the Kingsford Legal Centre provides free legal workshops to service providers in our local community. Where: the Kingsford Legal Centre, UNSW Campus, Kensington. Where: Stables Theatre, 10 Nimrod St Kings Cross. Griffin Theatre Company with the help of City Of Sydney, is proud to hold an unwaged performance of each of its main season productions. We would like to extend an invitation to you to attend the community performance of Silent Disco on the 25 May 2011. This performance will begin promptly at 2pm, and will take place at the Stables Theatre, 10 Nimrod St Kings Cross. - Please note that the theatre is very small (105 capacity) and is accessible only by stairs. - We always prefer each group to be hosted by a representative of your organization who can brief the clients on theatre attendance. - We ask that mobile phones are all turned off, and that your clients are encouraged to not talk loudly during the performance so as to avoid distracting the cast or other attendees. - Please be advised that the play will run for approximately two hours and twenty minutes and that there will be an interval in the production. - The content of the play is of a mature nature, and the play does contain language and adult themes, which we ask you to take into consideration also. These small requests may help you select which of your clients would most enjoy the theatre experience. If you would like to discuss the performance of Silent Disco, or if you would like to organise tickets to see the show, please contact Lizzie on 9335 1052. Redfern Community Centre Aboriginal and Torres Strait Islander Artist Program supports artistic development and expression with an emphasis on local community development through a diversity of art form practices. The residencies are open to Aboriginal and Torres Strait Islander artist and groups (emerging) encompassing a diverse range of practices and outcomes. As part of this Program RCC is offering a Performing Arts Residency Program that offers free workspace for artist/groups with a maximum 50 hours spread over a 6 month period. In 2002 Justice Health established the Consumer and Community Group (CCG) to provide a forum for issues related to the health needs of adult and juvenile detainees to be raised and a mechanism through which to advocate for the delivery of health services equivalent to those available to the general community. This consultation will inform the development of new priorities for the Justice Health Consumer and Community Group (CCG). Cost: There is no charge for the forum. Light refreshments will be provided. Register: Due to limited space, only people who have registered will be able to attend. Please complete the registration form and return it to Rose or Miguel at info@ncoss.org.au, fax 02 9281 1968 or phone 02 9211 2599 by 29 April 2011. 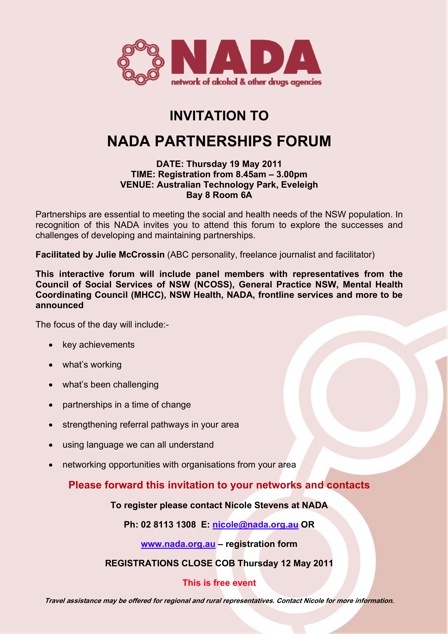 For further information, please contact Samantha Edmonds Samantha@ncoss.org.au or (02) 9211 2599 ext 111. GroundSwell is coming – Watch this space! · The way Government has under mined the work of community organisations by not advising local workers about local consultations that affect residents. · Government not funding initiatives like RedWater News which gave residents a voice and replacing it with newsletters that only give the Government line. · Government bodies that work behind closed doors for years on plan s for our community, but give residents only a month to read complicated documents on a website, think, discuss and comment on their plan. · Government saying it consulted lots of people about its plan when it really provided limited information to most people filling in a 5-question form with the incentive for some of a grocery voucher draw. · Government doing all this and then saying they are working in partnership with the community. Do you have other burning issues of concern as a resident in the Redfern and Waterloo area where you feel no one seems to listen? Then Join GROUNDSWELL TODAY and be part of the change you want to see. Do you work for a non-government organisation and want to know more about Parliamentary Inquiries, so that you can take part and influence policy? Do you want to build your skills in writing submissions or appearing as a witness? NCOSS and the NSW Legislative Council are jointly running a workshop on Parliamentary Inquiries: How to Have your Say and Maximise your Influence. Numbers are strictly limited. Please indicate in your RSVP if you have any specific needs such as a hearing loop, wheelchair accessibility etc. 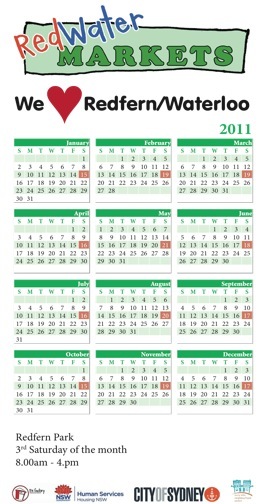 2011 will be an exciting year for The Koori Mail. They will be celebrating their 20th anniversary, and publishing the 500th edition in May. The event is shaping up to be a great night with some magical performances by some of Aboriginal and Torres Strait Islander Australia’s very best; a look at the events, people and influences that have shaped Indigenous Australia and inspired us all during the past two decades; a special announcement or two; a very memorable meal; dancing and much, much more. Tickets should be on sale via Ticketmaster around mid-March but we wanted to give you this ‘heads up’ so you could SAVE THE DATE in your diaries. A fun incursion for all of your children! Children of all ages with thrill to the blend of acting and puppetry in this workshop….. This workshop is designed to inspire, educate and to make sure the children have loads of fun! I hope to see many of you again, Julie Zommers. The first part of the workshop will be learning easy tips and skills about performing for an audience. There will be fun exercises for the whole group as well as working in small groups. Children will mime to backing tracks..many of you will know lost children by now….and how much the children loved acting with these puppets. Well, I’ve written many more songs to match more puppets, so they’re going to have a lot of fun! Children will then make a simple sock puppet with movable mouth, and perform skits for the audience! The next national Census of Population and Housing will be conducted on the night of Tuesday 9 August 2011. The Census aims to accurately measure the number of people in Australia on Census night, their key characteristics, and the dwellings in which they live. In order to assist in the preparation and operation of the Census, the Australian Bureau of Statistics (ABS) is recruiting around 43,000 community-minded field staff all over Australia, 10,000 of which will be in NSW and the ACT, to help us count the nation. If you would like to help support your community, enjoy working with people, and have time you can give, working on the Census is a great community-based activity that makes a real difference to Australia. - Area Supervisors are responsible for selecting, training, supervising and leading a team of Collectors. Area Supervisors will be required to work from 18 April 2011 until 7 October 2011 and will be paid between $4,300 and $7,500 depending on their workload. Applications open 12 February 2011. - Collectors are responsible for delivering and collecting forms from all dwellings in a specified area. Collectors will be required to work from 1 July 2011 until 8 September 2011 and will be paid between $1,100 and $2,300 depending on their workload. Applications open 9 April 2011. Where: Redfern Local Area Command on level 4. This action group will be meeting on the second Thursday every two months. Where: Our Place, Poet’s Corner shops in Morehead St. The market focus is (not exclusively) on sustainable goods, handmade, recycled or second hand, and is environmentally friendly. All monies raised from the stallholder-fees are injected back into the community supporting local environmental projects such as the Waterloo Recycling Workshop and the Cycle-Re-Cycle Club. 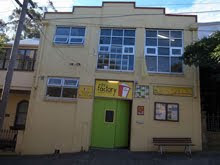 The Factory Community Centre held the RedWater Markets each month at Redfern Park as a community project within the Redfern / Waterloo area with the support of the City of Sydney, Clubs NSW and the Housing Communities Program (HCP) funded by Housing NSW. Second-hand clothes, books, recycled goods, flowers/plants, food, hand-made goods, community groups and others. Discounts on rates may be available for commercial stallholders and those who are raising funds for registered/constituted groups and charities, which benefit the local community. For more information please contact Edith Olivares, HCP Community Development Worker. Organised by Sydney Children’s Hospital “Aiming for Asthma Improvement in Children Program”.